Be the first to share your favorite memory, photo or story of Leonard. This memorial page is dedicated for family, friends and future generations to celebrate the life of their loved one. 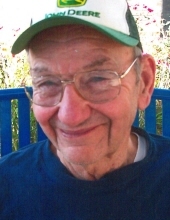 Leonard Richard Mahler, 87 of Dwight, IL died Thursday February 7, 2019 at 5:46PM at Heritage Health in Dwight, IL. Cremation rites will be accorded and a memorial service will be held at a later date. Inurnment will be at Abraham Lincoln National Cemetery, Elwood, IL. Memorials in Leonard’s name may be made to Kankakee Valley Hospice. Hager Memorial Home, Dwight, IL is handling the arrangements. Leonard was born on March 14, 1931 in Goodfarm Township, a son of William and Ida (Balzerick) Mahler. He married Mary Landers on May 28, 1998 in Pontiac, IL. She survives in Dwight, IL. Also surviving are two sons: Donald (Lori) Mahler of Elwood, IL and William (Dwight Christman) Of Des Moines, IA; two daughters: Marilyn (Steve) Beal of Carlock, IL and Carolyn (Mike) Gloeckle of Naperville, IL; two stepsons: Todd (Karen) Horrie of Gardner, IL and Timothy (Valerie) Horrie of Coal City, IL; one step-daughter: Deborah (Wayne) Wren of South Wilmington, IL; numerous grandchildren, step grandchildren and step great grandchildren; three sisters: Helen Lamons, Edna Cressey and Lucille Lenzie; one brother: Harold Mahler; loving nieces and nephews throughout the United States and Canada. Leonard was preceded in death by six sisters: Frieda Halfaker, Gertrude Krueger, Ruth Payne, Dorothy Lind, Erma Kline and Mildred Dinelli; one brother: Bill Mahler. Leonard was a farmer all of his life and formed a partnership with his brother Harold which was called Mahler Brothers Farming. Together they farmed in the Grundy and Livingston counties for over 50 years. He retired from farming in 1998 and moved to Dwight, IL. with his wife Mary. He served our country in US Marines from 1951-1953 during the Korean Conflict. "Email Address" would like to share the life celebration of Leonard Mahler. Click on the "link" to go to share a favorite memory or leave a condolence message for the family.